If you are looking for a fun dirt bike that is not too expensive, these popular models are sure to offer the excitement you are seeking without breaking the bank. In this price range you can expect to find brand new electric models that are made for teenagers or adults up to a certain weight limit, or gasoline-powered models that are modestly sized but will hit higher speeds and support heavier riders than their electric counterparts. Beyond that, used bikes are your best bet to stick in this price range. Here are some good new dirt bike options to consider. An excellent choice for youngsters is the Razor MX350 Dirt Rocket electric motocross bike. This is a great option for kids 12 and up who are not ready for the full speed and power of a gasoline-engine bike but are ready for a little bit of offroading. The MX350 is electric, powered by a 350-watt motor fueled by two 12-volt batteries that fully charge overnight. It can offer a full 30 minutes of use on a charge at speeds up to 12 miles per hour. The cool thing about the MX350 is that it is very quiet, making it a great choice for in-town families. 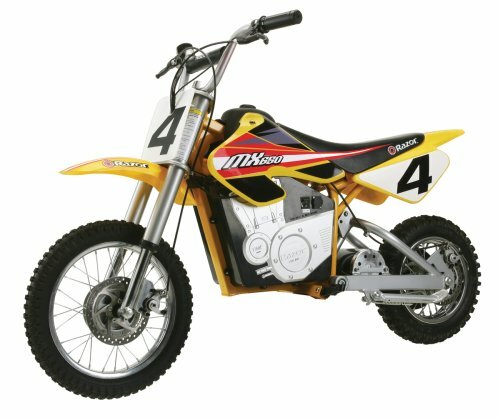 The fat knobby tires allow the bike to go on or off-road, and the twist throttle for acceleration and hand brake are intuitive for kids used to riding a bike. If your son or daughter is still growing, the adjustable handlebars will come in handy. This bike supports a rider up to 140 pounds. Older kids will like the added power of the Razor MX500 Dirt Rocket electric bike. It is very similar to the MX350, but will comfortably support a kid 14 or older up to 175 pounds. The motor is a more powerful 500-watt version, and the bike can move a bit faster - at speeds up to 17 miles per hour. For comfort, this model offers dual suspension and riser handlebars which help to make riding more comfortable and less bumpy. The battery will charge in around 8 hours and support a rider for up to 10 miles on a single charge. If it’s power you want, there is an even more powerful all-electric Dirt Rocket, the Razor MX650, that still holds down the cost to a reasonable level. This bike comes with an eager 650-watt electric motor to push bigger kids or even adults along without sacrificing performance. Like the MX500, it tops out at around 17 miles per hour, but the bigger frame will support riders up to a full 220 pounds. The MX650 can go for up to 10 miles, or 40 minutes, on a single charge. The Moto Tec 24v electric bike has a neat feature that may put some parents’ minds at ease. There is a key lock feature that allows discerning parents to set the maximum speed allowed at either 5, 10, or 16 miles per hour. With 2 12-volt batteries and a 500-watt electric motor, this model can easily support a kid 12 and up that weighs up to 150 pounds. The throttle is a simple twist grip version, and the bike has both front and rear disc brakes. To provide a smoother ride, 1 rear shock and 2 front shocks are set on the steel frame. This makes it feel solid yet nimble. For a good value in a gas-powered bike, the DB49A 49CC mini dirt pit bike is a great place to look. The motor is a single cylinder 2-stroke engine that is air cooled for lasting performance. This dirt bike will zip along at speeds up to 35 miles per hour and is easy to drive, thanks to a fully automatic transmission. The DB49A will support a rider up to 145 pounds. It holds 1 gallon of gas and uses a gas/oil mix, so you can pre-mix your fuel in a gas can to have ready for simple refueling. 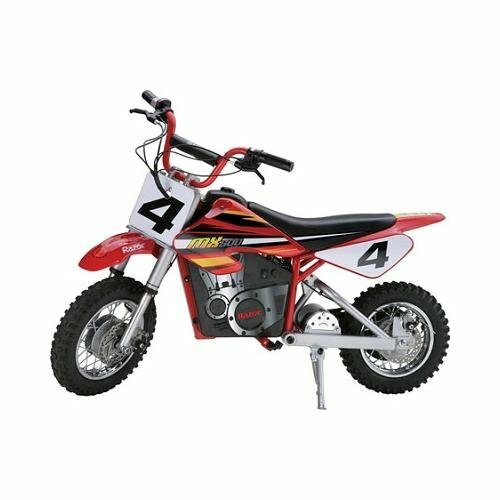 If you are looking for a mini dirt bike with a punch that is low in price, this is it. You can find the bike in several different colors. For new dirt bikes under $500, any of these models will get off roading in style. Also, if you you have any questions, comments or concerns regarding either the showcase article of best dirt bikes under 500 dollars or about any of the models specified above then please do not hesitate to make them in the comments section just below and we will be sure to get back to you as soon as possible.